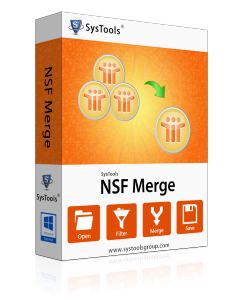 NSF Merge tool is perfectly designed to combine NSF files irrespective of versions of Lotus Notes. With this tool user can manage their old Archived NSF files easily and store them in a single file. The tool to merge multiple Lotus Notes archives will let you offers two options to unite them i.e. Join or Merge. Moreover, users have option to eradicate duplicate as well as deleted content from the outcome. If users opt this feature all the selected NSF files are merged together and get placed in a single file. Merge feature is a bit differ from Join as in this process all the data folders of Lotus Notes of one file get merged with another folder of NSF file. To Merge NSF files Join is another option in which selected files are placed as it is in the folder. The tool will not going to mess up the folder of one file with another instead of, it placed all the desired file as it is without any alteration. A Tool to Merge Lotus Notes Archives will provide users maximum reliability at the time of merging NSF files. The software allows users to remove duplicate content from the result that helps in handling and reducing the size of files. There is another option of Deleted data removal that offers you authority to remove undesired data. This is additional property entirely depends on the user requirements. If they want to just check in the option analyze the results. Software to merge multiple Lotus Notes archives will let user free to unite unlimited NSF files. The software will cover all the items of data holder like Emails, Calendar, Contacts, Journal & To-do and merge them without any alteration. When software merges the Lotus Notes NSF files it starts maintain a log report of all files & folders that are going to merge. Once combined NSF files, user can download this status report as a CSV file that helps users in several ways. Software to combine NSF files will not allow any alteration to the Meta properties. No Restrictions to the size of NSF files that are going to unite. User can merge any no. of NSF files of any size. Users have two options to merge multiple Lotus Notes Archives i.e. Join or Merge. Software provides option to Exclude Duplicate data on the basis of Email Header and Dates similarities. Also users can Eliminate Trash data, if they want check in the option and software work accordingly. NSF Merge tool combine old archived NSF files with the newer one without considering the versions of Lotus Notes. The best method to evaluate the NSF Merge software is download its demo version that efficiently merge 15 data items and Join 2 folders. How to Merge Lotus Notes Archives? Download the Demo Version that allows users to Join 2 NSF files and Merge 15 data items. Does tool restrict us while merging NSF files? Not at all, software does not restrict users anywhere; user can merge unlimited NSF files. Will software safely unite name.nsf file with another? Yes off course! Tool to merge Lotus Notes Archives will separately unite names.nsf file with another file. How Join is different from Merge Option? Both the options will do the same work, but in a different manner. Join option takes all the files and keep them safe as it is without any changes to the original name of files. Merge Option will combine all the folders of Lotus Notes and unite with other NSF files. Is Lotus Notes Environment is necessary to run the software? Yes definitely, the basic need to run the software is Lotus Notes should be in active mode. Will software combine locally encrypted emails? No tool to combine NSF file cannot read the encrypted mails of Lotus Notes. It unites all the data files and leaves the encrypted one. What a brilliant tool you guys discover… I never thought about the software that will successfully merge all the archived files with ease. The Tool is really incredible....Keep it up! I would like to explain this NSF Merge tool in one word, i.e. "Unbeatable". This software helps me a lot in merging older archived files. Really, I am grateful to your team. This tool is extremely amazing. Its property of Data exclusion and auto removal of duplicate content is speechless. I am very thankful to your team who made my life stress-free. No words to express my feelings. It's a great tool.